So it’s been two weeks since the Moodlemoot in Dublin drew to a close, however the buzz and energy from those four days is still there, inspiring me to further explore improvements in Moodle usage and interface. Firstly, have to give a huge thanks to all the attendees and presenters for their patience, enthusiasm and attentiveness for the sessions and overall in making it a very engaging atmosphere. It was so wonderful to have ye all there. Next I must thank the programme committee who helped go through all the submissions where each proposal was reviewed by at least five of the committee. I must also thank the very supportive sponsors who helped make the Moodlemoot what it is. The National Institute for Digital Learning (NIDL) were a huge help in helping organise the conference and the programme committee. The gold sponsors Catalyst, Enovation Solutions, Kaltura and Moodlerooms and silvers sponsors Mind Click, Planet eStream, ULCC and Webanywhere all contributed to make the Moodlemoot great. Lastly but not least, I should say that it was really cool having so many from Moodle HQ there, with their keynotes, presentations, the new Moodle working groups and of course the hackfest. It all brings an extra dimension to the Moot. As I tweeted, my main take away from the Moot is the focus on improving the student experience. This is being approached from many sides through analytics, interface design and curriculum design (with personalised learning). This year we went with segregated streams for Moodle in Education, Moodle in the Workplace and Moodle Technical presentations. It was something that I had wanted to try before but this time we took the risk and so far from feedback it looks like it worked out well. The Moodle in the Workplace stream lasted one day and included some great examples of using Moodle outside of the academic world, in healthcare, in the Civil service, for compliance training, for delivering Badges centrally for many schools and a well designed MOOC site which demonstrated what a Moodle based learning experience can be with some investment and design. The Moodle in Education stream went over the two main days, and had a wide range of presentations from many institutions which touched on many aspects of online delivery including multimedia usage, student created content, learning analytics and administration. The Technical Moodle stream lasted one day and covered a number of technical processes as well as some useful developments that raised a lot of interest. The use of Behat in testing was one presentation which many commented on that it would change how they implemented testing in the future. This year we restricted presentations to three formats; short presentations of 15 minutes length, Pecha Kucha of 6 mins 40 seconds length and Posters which saw a lot of interest. We had eleven posters this year covering a wide range of topics including the 70:20:10 approach to course design for social learning, the plugin ecosystem and how to choose which assignment to use. Posters can deliver a lot of learning quickly and it was great to see more uptake in the format this year and hopefully the central placing of the posters will encourage more next year to embrace this sharing approach. We had four keynote sessions, top and tailing each of the main days. Day one saw Dr. Bart Rienties, Reader in Learning Analytics at the Institute of Educational Technology at the Open University UK give a keynote on Learning Analytics: The good, the bad, or perhaps ugly? which was extremely informative on the topic in general and how the Open University are going about this. The end of day keynote was a keynote from Martin Dougiamas where he discussed Feedback as the central aspect to learning. It certainly makes you think more and more about the type of feedback you give to others and how you receive and process the feedback you get yourself. Day two saw Dr. Michael de Raadt, Research Director of Moodle HQ keynote on Personalised learning and Moodle. This is an area which clients always ask about, how to approach it in their online courses and what to do and not do – so is essential viewing. At the end of the second day, Martin Dougiamas held a session on the Moodle Association and how it will work and operate, facing a lot of questions from the floor. 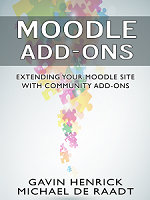 There is so much potential in the Association – it will be great to see it up and operational, and helping to shape the roadmap of features for Moodle. This year we had managed to negotiate with NIDL that they would provide sunshine along with the coffee and they did not let us down. Personally, I found it great to have a few minutes fresh air walking to lunch and between the main building and keynote. Being inside all day can be a bit overpowering and that sunshine was very welcome. Let’s hope London can deliver the weather too. I am not sure which was liked more but there was not many left of any of them after the Moodlemoot and hackfest, so I shall take that as a dead heat. For those who can’t find them in your local store the websites are linked above. If you havent filled in the feedback survey from attending the Moodlemoot, please do so over at the Moodlemoot site – you will need to log in via Moodle.org. This entry was posted in Moodle and tagged 2015, Moodle, Moot. Bookmark the permalink. Thank you again Gavin, and all your helpers, for running the conference. Great effort.